Trackpoints are tiny joysticks that react to pressure , convert that pressure into relative x/y events and pass that on to whoever is interested in it. The harder you push, the higher the deltas. This is where the simple and obvious stops and it gets difficult. But then again, if it was that easy I wouldn't write this post, you wouldn't have anything to read, so somehow everyone wins. Whoop-dee-doo. All the data and measurements below refer to my trackpoint, a Lenovo T440s. It may not apply to any other trackpoints, including those on on different laptop models or even on the same laptop model with different firmware versions. I've written the below with a lot of cringing and handwringing. I want to write data that is irrefutable, but the universe is against me and what the universe wants, the universe gets. Approximately every second sentence below has a footnote of "actual results may vary". Feel free to re-create the data on your device though. Pressure range one: When resting the finger on the trackpoint I don't really need to apply noticable pressure to make the trackpoint send events. Just moving the finger on the trackpoint makes it send events, albeit sporadically. 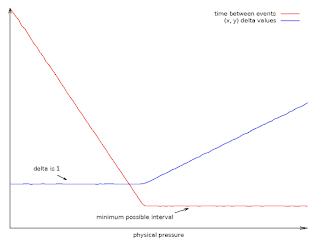 Pressure range two: Going beyond range one requires applying real pressure and feels to me like we're getting into RSI territory. Not a problem for short periods, but definitely not something I'd want all the time. It's the pressure I'd use to cross the screen. Pressure range three: I have to push hard. I definitely wouldn't want to do this during everyday interaction and it just feels wrong anyway. This pressure range is for testing maximum deltas, not one you would want to use otherwise. The first/second range are easier delineated than the second/third range because going from almost no pressure to some real pressure is easy. Going from some pressure to too much pressure is more blurry, there is some overlap between second and third range. Either way, keep these ranges in mind though as I'll be using them in the explanations below. It is impossible to provide a constant input to a trackpoint if you're a puny human. Without a robotic setup you just cannot apply constant pressure so any measurements have some error. You also get to enjoy a feedback loop - pressure influences pointer motion but that pointer motion influences how much pressure you inadvertently apply. This makes any comparison filled with errors. I don't know if I'm applying the same pressure on the two devices I'm testing, I don't know if a user I'm asking to test something uses constant/the same/the right pressure. Not all trackpoints are created equal. Some trackpoints (mostly in Lenovos), have configurable sensibility - 256 levels of it. So one trackpoint measured does not equal another trackpoint unless you keep track of the firmware-set sensibility. Those trackpoints also have other toggles. More importantly and AFAIK, this type of trackpoint also has a built-in acceleration curve. Other trackpoints (ALPS) just have a fixed sensibility, I have no idea whether those have a built-in acceleration curve or merely have a linear-ish pressure->delta mappings. Due to some design choices we did years ago, systemd increases the sensitivity on some devices (the POINTINGSTICK_SENSITIVITY property). So even on a vanilla install, you can't actually rely on the trackpoint being set to the manufacturer default. This was in an attempt to make trackpoints behave more consistently, systemd had the hwdb and it seemed like the right place to put device-specific quirks. In hindsight, it was the wrong design choice. Deltas are ... unreliable. At high sensitivity and high pressures you might get a sequence of [7, 7, 14, 8, 3, 7]. At lower pressure you get the deltas at seemingly random intervals. This could be because it's hard to keep exact constant pressure, it could be a hardware issue. evdev has been the default driver for almost a decade and before that it was the mouse driver for a long time. So the kernel will "Divide 4 since trackpoint's speed is too fast" [sic] for some trackpoints. Or by 8. Or not at all. In other words, the kernel adjusts for what the default user space is and userspace is based on what the kernel provides. On the newest ALPS trackpoints the kernel has stopped doing any in-kernel scaling (good!) but that means that the deltas are out by a factor of 8 now. Trackpoints don't always have the same pressure ranges for x/y. AFAICT the y range is usually a bit less than the x range on many or most trackpoints. A bit weird because the finger position would suggest that strong vertical pressure is easier to apply than sideways pressure. (Some? All?) Trackpoints have built-in calibration procedures to find and set their own center-point. Without that you'll get the trackpoint eventually being ever so slightly off center over time, causing a mouse pointer that just wanders off the screen, possibly into the woods, without the obligatory red cape and basket full of whatever grandma eats when she's sick. Ok. If you've been paying attention instead of hoping for a TLDR that's more elusive than Godot, we're now aware of the various drawbacks of collecting data from a trackpoint. Let's go and look at data. Sensitivity is set to the kernel default of 128 in sysfs, the default reporting rate is 100Hz. All observations are YMMV and whatnot, especially the latter. 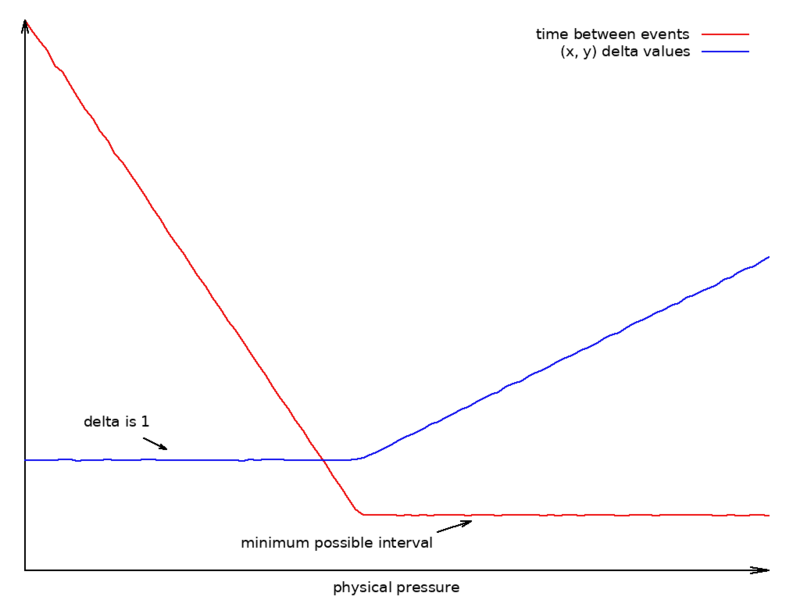 This was me pressing lightly but with perceived constant pressure and the time stamps between events go from 20m to 180ms. Remember what I said above about unreliable deltas? Yeah, that. Note how there is an events in there with 22ms? Maintaining constant pressure is hard. You can re-create the above recordings by running evemu-record. Pressing hard I get deltas up to maybe 5. That's staying within the second pressure range outlined above, I can force higher deltas but what's the point. So the dynamic range for deltas alone is terrible - we have a grand total of 5 values across the comfortable range. Changing the sensitivity setting higher than the default will send higher deltas, including deltas greater than 1 before reaching the report rate. Setting it to lower than the default (does anyone do that?) sends smaller deltas. But doing so means changing the hardware properties, similar to how some gaming mice can switch dpi on the fly. Well, that was fun, wasn't it. I'm glad you stayed that long, because I did and it'd feel lonely otherwise. In the next post I'll outline the pointer acceleration curves for trackpoints and what we're going to to about that. Besides despairing, that is. I doubt you will be, but it always pays to be prepared. In this post I'm using "pressure" here as side-ways pressure, not downwards pressure. Some trackpoints can handle downwards pressure and modify the acceleration based on it (or expect userland to do so). Not that this number is always correct, the Lenovo CompactKeyboard USB with Trackpoint has a default sensibility of 5 - any laptop trackpoint would be unusable at that low value (their default is 128). I honestly don't know this for sure but ages ago I found a hw spec document that actually detailed the process. Search for ""TrackPoint System Version 4.0 Engineering Specification", page 43 "2.6.2 DIGITAL TRANSFER FUNCTION"